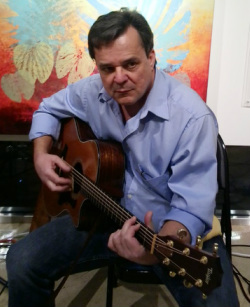 Performer: Tom Rotchford, AKA "Rotch" - a versatile vocalist, prolific songwriter, and multi-faceted guitarist. Tom’s early performance career began as a Hartford CT born “student of the Folk Mass movement” introducing contemporary music into the Christian rituals of the times back in the 1960's. Tom performed the weekly folk mass at St. Augustine's Church in Hartford with his brother and sister to a loyal crowd of “you’re going to play that kind of music in a church of God” enthusiasts. The Rotchford Family voices of Jim, Kathy & Tom Rotchford were truly angelic with three part harmonies that made parishioner’s hearts sing. The Brothers Rotchford played rocking guitars to wake the early morning churchgoers & school them on what Sunday Folk was all about. During the “70’s” Tom was involved in acoustic trios & solo performances. Rotchford, Cooney & Davis began the musical odyssey that enabled the young singer/songwriter to introduce his own style of original music to the New Haven area college music scene along with two other amazingly talented musicians, stellar song writer & guitarist, Tom Cooney & flute/woodwind player extraordinaire Lou Davis. Tom eventually segued his talents into the Folk/Rock trio of Grey Haven playing in Connecticut bars & night clubs. The mid 80’s introduced the four piece Classic Rock & Blues band EXCEL to the Hartford Area bar scene. As lead vocalist for the band, Tom enchanted crowds with soulful ballads & driving Rock & Roll tunes. Tom played rhythm guitar along side blues guitarist & vocalist Martin Kelly & drummer Brian Swahn. EXCEL was the first full band in which Tom collaborated with talented Coventry bass player Donn Federowicz. The duo of Tom & Donn would go on to appear at coffee houses & cabarets performing a mix of lyrical songs with extraordinary harmonies to audiences throughout CT.
Tom & Donn got together once again in the 1990’s to play with the Country/Rock band Hard Luck Aces. 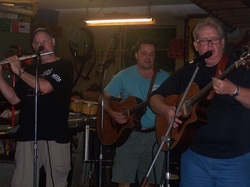 Brothers Jake & Gene (Wee) Ciccarelli had established the Hard Luck Aces legacy throughout Eastern Connecticut with tight musical arrangements, premier pedal steel playing, & tasty lead guitar licks accompanied by fine country vocals. Old country, new country, it was all good, as Tom & Donn brought their unique style of song arrangement & harmonies to this noted group of country musicians. Wee Ciccarelli & Tom Rotchford introduced original songs to the set-list along with county & classic rock standards. Tom Rotchford has recently established the Right Moment Band with a seasoned group of musicians & vocalists. Tom expects that this project will provide a lyrical exclamation & musical summary to some 40 Years of artistic creativity & performance. It is all about the song – and that point in time where you will get a chance to share in the experience with - The Right Moment Band. 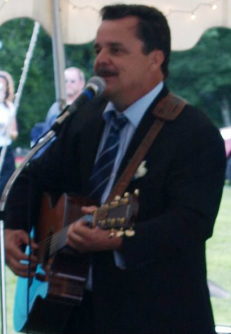 Connecticut native, Tom Rotchford lives in Tolland County CT. For a schedule of performances, Tom can be reached at www.RightMomentBand.com or Rotchsongs@gmail.com. Rotchford, Cooney & Davis at the Davis Jam Fest circa 2012. Tom Rotchford, Donn Federowicz, & Scott Peszko perform at the Hartford Public Library.